Lest anyone think fundraising is the only obstacle to getting next-generation telescopes (such as the Giant Magellan Telescope in which Texas A&M University is a founding partner) off the ground, the New York Time’s Gerald Brown recently weighed in on another area of tough, at-times-touchy sledding — drawing the line between spirituality and science. 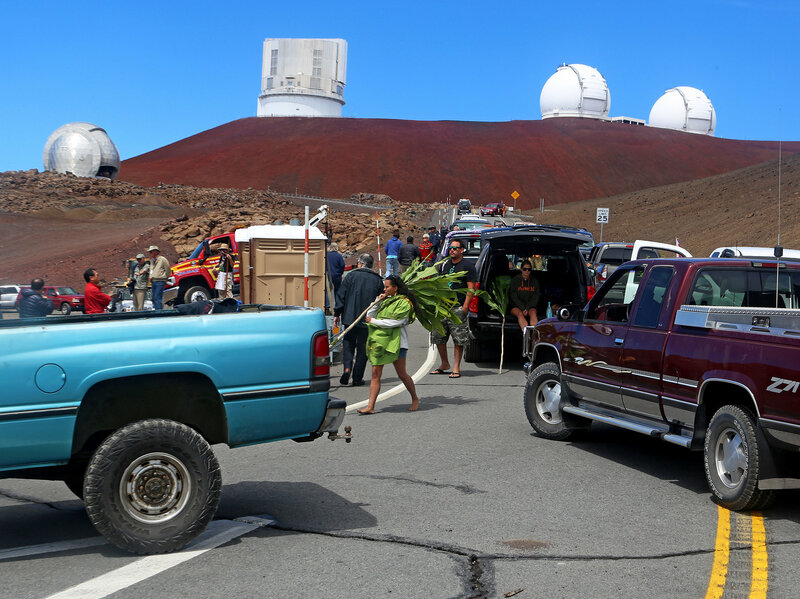 As Brown explains, this age-old debate most recently played out in Hawaii and on YouTube, among other venues, concerning a protest by Native Hawaiians that disrupted the October 7 groundbreaking ceremony for the Thirty Meter Telescope. As with all things astronomical, I forwarded the NYT link to Texas A&M astronomer Nick Suntzeff, who grew up in California, studied at Stanford University and at Lick Observatory and also spent 20 years as an astronomer in Chile, where he helped co-discover dark energy in between helping to save Alan Alda’s life, among other feats. Nick offered his two cents in the usual colorful manner I’ve come to both expect and love. I agree this is a great article. I, too, have been part of controversies about native claims to mountains as sacred sites. The mountains of Junipero Serra, Cerro Tololo, Quimal, Cerro Toco and Kitt Peak come to mind as having been claimed to be sacred. Quimal, which is perhaps the best mountain in Chile for astronomy, definitely is a sacred mountain, and we did not try to study it, except to verify that it did have burial sites on the summit. Kitt Peak is also sacred, but it is not an important site in the Tohono O’odham culture as is the Baboquivari Mountain to the south. The article expresses the delicate point that indigenous peoples have been totally screwed by western expropriation of their lands, and fighting any fight to show their plight is totally understandable. In the case of Hawaii, the astronomers initially did not reach out to the Native Hawaiians and alienated them early on. There is not a small amount of support among the Native Hawaiians for astronomy, but we were late in including them in the discussions. I have always been uncomfortable with this issue since we are sympathetic to native beliefs, yet are often vocal against similar beliefs in mainstream religion. I am very glad George Johnson brought that up in his article. Few people have ever touched on that point of conflict. Yep, there he goes again, creating another story within a story. Nick’s the master of a well-placed tangent, and by this point, he should know I’m an absolute sucker for those. Move over, Kevin Bacon; you’re been replaced by six degrees of Nick Suntzeff, and I’ve got to know the rest of the story on this one! And, true to form, Nick does — about the legendary artist and then some. As I’ve said time and again, the man’s a walking history book and a born educator. The quick answer: Ansel Adams lived near Santa Cruz and Monterey (I’ve forgotten where). Around 1975, Lick Observatory was involved in building a new telescope that would be even larger than the Palomar 5-meter. They (Dr. Merle Walker) studied mountains in California and Mexico and found that the best mountain was Junipero Serra Peak, the tallest mountain in the central coast range of California that is more than 5,000 feet while only about 10 miles from the coast. He did an onsite survey measuring the turbulence and found it was an outstanding peak. As the highest mountain, it was claimed to be a sacred mountain by the local Native Americans. The problem was that there was no evidence anywhere that this mountain was sacred. The local Indians claimed an oral tradition, but again, there was no evidence for this until after the astronomers were interested in the mountain. The mountain is inside a wilderness area, so it is protected and would take a special permit to build there. So, just like Hawaii, there was a problem between astronomers and the locals. I hiked the mountain once (it is a tough climb), and I thought it was one of the most beautiful mountains in California in the springtime. It is so high that the forest there is an isolated stand of sugar pines, which are common in the Sierras. The mountain has permanent snow in the winter, so the top of the mountain is alpine country like the Sierras. There is only one other mountain — Cone Peak — nearby that also has a few sugar pines. The pines are dying fast, and the forest will be lost in the near future. I am not sure how, but someone knew someone who knew Ansel Adams, who was an avid amateur astronomer. He supported the building of the observatory (provided that it had minimal impact on the mountain). So I was roped into being a chauffeur for him, taking him to maybe two public meetings. His mere presence there made a big impact. 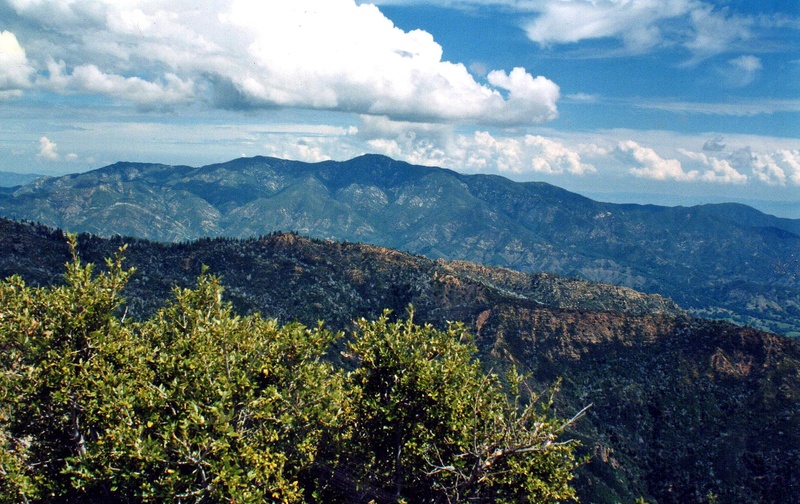 Junipero Serra Peak, as viewed from nearby Cone Peak. Texas A&M astronomer Nick Suntzeff has climbed the mountain that once connected him with legendary American artist Ansel Adams, who along with a proven penchant for iconic photography, also had an avid amateur interest in astronomy. He was a private sort of person, so I did not get to know him well. But I did find out that, along with his famous photos, he also had some sort of telescope and took astronomical photos for fun. I imagine these were all destroyed along with the original photographic plates and negatives when he died (a common thing photographers do). I would have liked to see some of his plates. Since I also took photographic plates for astronomy (yes, I am that old), we talked mostly about the techniques of astrophotography. I have never heard of anyone talking about his astrophotography. P.S. This is really old history, and I wish I remembered more details of our conversations. His Wikipedia entry does mention his interest in astronomy, and they have the fact which I never knew that his father was the treasurer for the Astronomical Society of the Pacific. The ASP is the other professional astronomy group in the U.S., that unlike the American Astronomical Society, includes amateur astronomers as members. He was treasurer from 1925-50, a major position which would have put him in the Executive Council of the ASP. And here’s a fascinating primer on the artistry behind the icon, authored by a pretty good photographer in his own right, the Eagle’s Dave McDermand. This entry was posted in Astronomy and tagged Ansel Adams, curiosity, Giant Magellan Telescope, Junipero Serra Peak, Nick Suntzeff, personal touch, power in observation, public education, relationships, Thirty Meter Telescope, why we're blogging by Shana Hutchins. Bookmark the permalink.